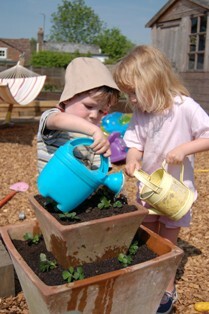 How do you get children interested in gardening? Let's be honest, kids are naturally attracted to gardening. It's the mud that does it.. and the water. I find the really difficult bit is getting them to move from this stage of general mayhem into something more focused and productive. There are a few pointers which can help. Grow something to eat- children are so proud and excited to think their efforts have actually produced food. I also find they're more likely to try vegetables if they've grown them. The right tools and clothes - assign your children some gardening clothes - they could even customise their own t-shirts, trousers or hats with some fabric pens. Also invest in some decent child-sized tools (the cheap and colourful ones sold in most places are so badly made and weak they're as good as useless). Let them get on with it - your child's patch might not look beautiful to you, but if they're using it and enjoying it, try not to interfere. Sadly, I don't always practice what I preach - particularly when my children's 'bold' plant choices threaten my poncey designer planting schemes. But I'm getting better... slowly.